A Utility Knife is one of those tools that give you a hand whenever & wherever you need to cut something immediately. I'm sure all you know what it's like to search for a suitable thing when you urgently want to cut something like a wire or a piece of thick twine. For those of you who still can't make out what I'm speaking about, ever heard of a box cutter or a razor blade?? Referred to in different ways, all the above narrow down to technically termed as a Utility Knife . The construct of this tool mainly comprises of an oblong, flat plastic or metal holder that holds a treacherously sharp stainless steel blade within that can be accessed usually by a 'slide in & out 'kind of a mechanism or referred as a retractable utility knife where in the height of the blade can be adjusted according to the thickness of the material that is being cut. In some models the blade 'folds back' into the plastic holder. Most of the blades for the earlier models were double edged & were made to be multipurpose. But the recent ones are manufactured keeping specific purposes in mind. For example, the utility knives that are used to cut electrical wires are broader & the segments are bigger compared to the ones that are used at home to mend pencils & cut paper, cardboard etc. The blades manufactured especially for utility knives come in varying sizes depending upon the holder they are contained. They mainly have a shiny shaft that has demarcations at regular intervals constituting a segment. The segment can be broken off along the line when the blade looses it's sharpness within that part & the successive segment can be put to use. Some utility knives come with an option of storing the spare blades within the utility knives itself. 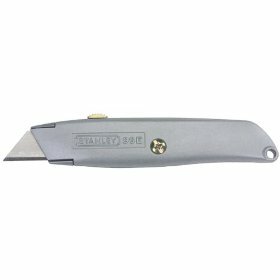 You might picture a stanley utility knife when refering to these, as stanley tools is a well known and common company that produces these knifes. Also the stanley utility knife does come in a variety of styles and you can get one to fit your exact needs. A really pleasing fact about utility knives is that it's so uncomplicated to the extent that most people have stopped looking at it with the exact notion of a 'tool'. It is more likely that we relate to it as this harmless thing that seems to lie everywhere around the house & comes in handy to do almost every errand like tightening a loose screw on the door or cutting the ribbon on a birthday present. On the more serious side, utility knives are really compact & light weight & thus can be slipped into your pocket while you are on the top of a ladder trying to get some connections right. This knife is the best tool to cut open goods that come wrapped in heavy shipping materials like sacks & low quality leather packages or even plastic/nylon coverings. With respect to the social scenario, a Utility Knife can be used as emergency defence devices against unexpected stranger attacks, though it's not a tool that can particularly be regarded as a 'weapon'. Some countries do not allow students to use them within the school premises. No doubt utility knives are one of our best friends!! Return From the Utility Knife Page to Home - Finishcarpentryhelp.com.